The construction industry was urged to get ready and prepare to adopt the industrialised building system (IBS) within three years before it is made mandatory, a statement revealed by Malaysia Deputy Prime Minister, Datuk Seri Dr Ahmad Zahid Hamidi in July 2017. A high level committee meeting on Enforced Implementation of IBS Usage in the Construction Industry was held to study the proposal to make the IBS compulsory through the legislation of laws, by amending the current UBBL. The statement brought a strong message to the industry players, which include developers, consultants, contractors, manufacturers, suppliers and other stakeholders, to furnish themselves with necessary knowledge and resources of IBS before getting eliminated by the changes of policies. According to IJM Corporation Berhad’s CEO and Managing Director, Datuk Soam Heng Choon in the NCCIM Economic Forum 2017, all development orders (DO) for projects that are more than 50,000 square meter from the Greater Klang Valley must obtain an IBS score of 50 by year 2018. Currently the IBS adoption is at a level of 35% and expected to achieve 50% by year 2018. He also opted that the adoption must be implemented gradually and some persuasive compulsions are required to eliminate the cheap labour, to reduce waste, and to have clean roads and sites. As an effort to boost the usage of IBS in Malaysia, CIDB aims to increase 100 new IBS manufacturers to a total of 300 by year 2020 by introducing various types of incentives under the Construction Industry Transformation Programme (CITP), 2016 – 2020. IBS implementation is encouraged due to its advantages against the conventional construction and building methods. The advantages of IBS include shorter construction time, cost saving, low labour dependence, better finish product quality, optimum material usage, waste reduction, increase of site safety and neatness, and lower weather impact to construction progress. With these advantages, the implementation of IBS is believed to lead to a greener environment and bring to the benefit of better civilisation. Despite the undeniable benefits brought by IBS, some industry players doubt the practical implementation of IBS in Malaysia. First Nationwide Group Director, Tan Sri Teo Chiang Kok viewed that the IBS adoption must be executed in line with the efficiency and effectiveness of property development processes. Tan Sri Teo gave example that being efficient in constructing the physical building only is pointless if the approval processes and CCC took years to complete. Real Estate and Housing Developers Association Malaysia’s (REHDA) President Datuk Seri FD Iskandar also claimed that a lot of issues related to the IBS adoption are still questionable, including the high cost of machinery due to low economies of scale, negative perception on the quality of IBS and workers skills in preparation for the adoption. In addition, Malaysia Investment Development Authority (MIDA) also recognised the shortcomings of IBS adoption during the IBS Housing EXPO 2016. The shortcomings include the high initial IBS setup cost, reluctance to change, low standardisation of IBS components, negative perception on IBS, availability of cheap labour, lack of integration in design stage, poor human capital development, and lack of sustainable volume and demand. Various measures and initiatives have been taken by the Government, CIDB, MIDA, and other Government related organisations to overcome these challenges to promote IBS adoption. Among measures taken are organising comprehensive awareness programs, providing Government incentives, restructuring IBS training programs, conducting research and development for IBS, and promoting sustainability development and green construction. The proposed measures are expected to increase the confidence of industry players to participate actively in adopting IBS and ultimately lead to 100% adoption of IBS in construction and building industry. The full adoption of IBS in Malaysia is not an easy journey. Theoretical benefits of IBS adoption are easy to be told but the practical efficiency and effectiveness of the IBS are still very questionable for most of the industry players. 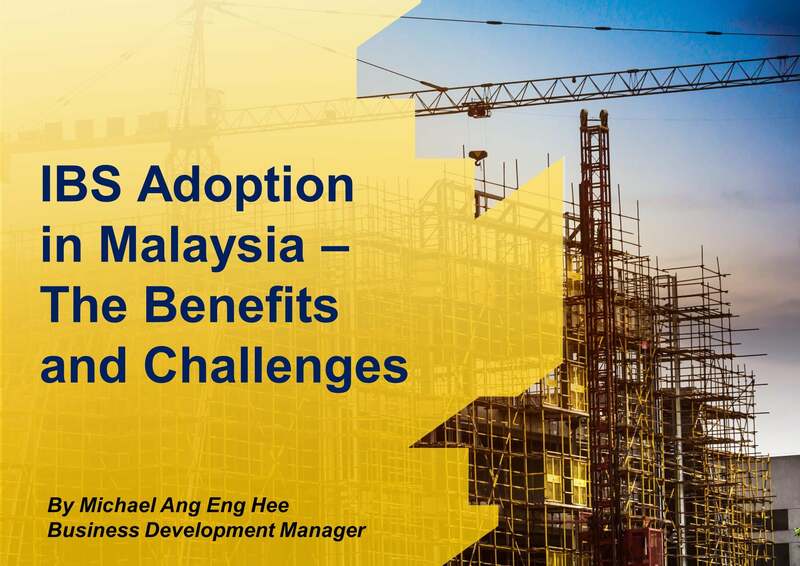 In order to increase the adoption of IBS in Malaysia, the Government shall study thoroughly on the real benefits brought to the industry and improve concurrently on other aspects of construction and building industry, e.g. the lengthy approval processes. By that, full adoption of IBS will eventually be a reality and lead to a better Malaysia.